Over the last few months, very few art exhibitions have caught my eye. As my taste in art twists into something completely unrecognisable from just a few years ago, I’m finding myself increasingly frustrated with the exhibitions that make it to Scotland. While I always appreciate talent when I see it, I long for something with significantly more substance than another gallery wall covered in large polka dots. When I find myself jaded with the selection of art on offer, I pay a visit to Salvador Dali’s Christ of Saint John of the Cross and marvel at the level of talent and patience required to create such an extraordinary painting. After all these years of staring at Christ of Saint John of the Cross, I’ve been oblivious to the fact Salvador Dali became a household name after creating textiles for New York based Wesley Simpson Custom Fabrics. I’ve only ever known him as a painter but the Artist Textiles exhibition at the New Lanark Visitor Centre introduced me to a whole new world of his creations. While the New Lanark World Heritage Site is home to recreations of millworkers’ homes from the 18th century, historical functioning machinery and incredible views of the River Clyde, it also features a wide variety of exhibitions all year round. Until April 29th, New Lanark is playing host to over 200 rare pieces from the likes of the aforementioned Salvador Dali, pop art pioneer Andy Warhol, Cubism co-founder Pablo Picasso and Fauvism frontrunner Henri Matisse. Despite my taste in art gravitating more towards politically inspired pieces, I will always welcome the chance to gaze upon the works of the masters. 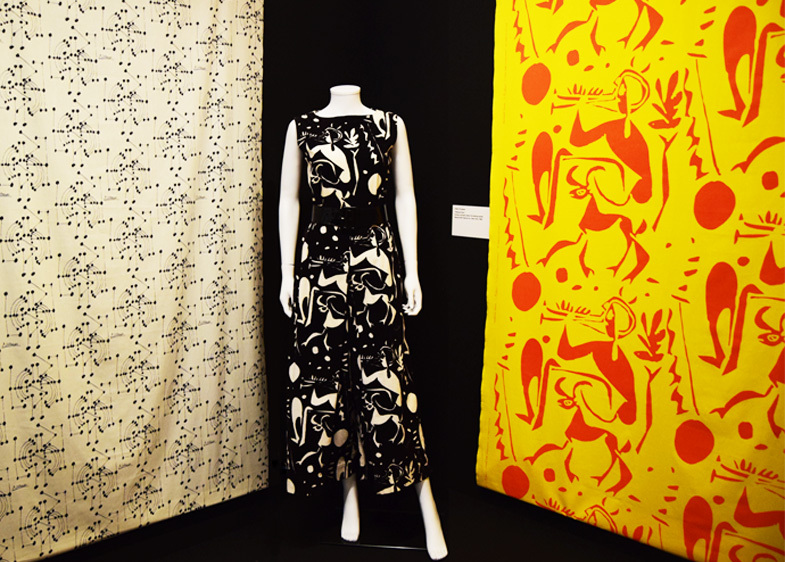 As soon as you walk into the building containing the Artist Textiles exhibition, you’re met with a flood of colour courtesy of designs by artists such as Sonia Delaunay, Barbara Hepworth, Henry Moore and Alexander Calder. 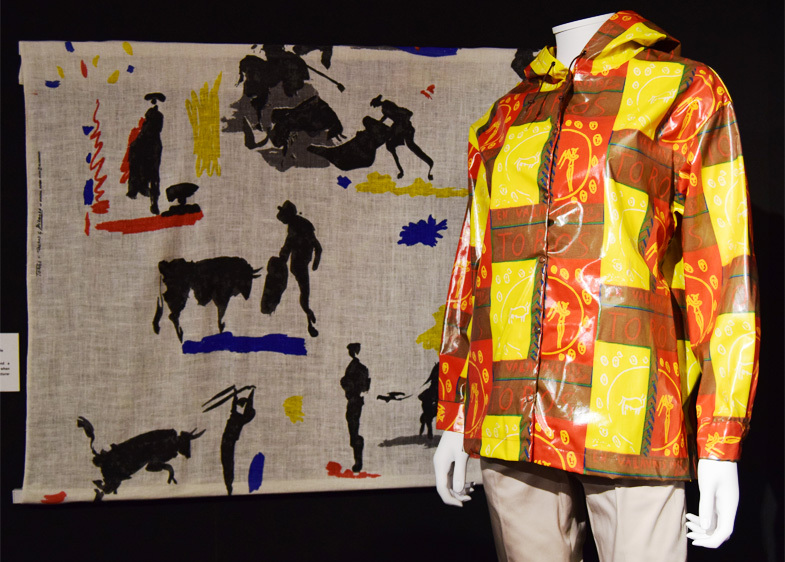 Printed material decorate the walls while mannequins model dresses, skirts and a rather fetching Pablo Picasso waterproof jacket that wouldn’t be out of place in the muddy fields of a music festival. The exhibition is perfectly laid out which allows you to view each piece without the intrusion of the bright and often busy work of art next to it. The designs are all accompanied by a few sentences about the history and creation of the work but chances are, you won’t be able to drag your eyes away from any of the displays to actually read the words. While the exhibition is fairly small, my other half and I spent two hours fully immersing ourselves in each piece. We often found ourselves wandering around displays a few times before moving on to the next part to ensure we had really taken it all in. It was the Pablo Picasso display that continued to capture my other half’s attention; he’s always been a huge fan of Picasso's art but has never been blessed with the privilege of standing in front of original pieces. Picasso’s work features prominently throughout the entire exhibition. His monochromatic design adorns a jumpsuit placed in front of two of his prints from the 1960s; one bold and colourful, one understated and geometric. It’s not difficult to pick out the rest of Picasso’s designs once you’ve familiarised yourself with just one of his creative explosions. The entire section dedicated to him follows a natural progression from designs that wouldn’t look out of place in a primary school classroom to more sophisticated yet simple drawings of bullfighters and art inspired by Picasso’s second wife, Jacqueline Roque. While my other half was engrossed in the large Picasso section, it was the Andy Warhol designs that drew me in. Admittedly, I’ve never been a huge fan of Warhol’s work. My first real introduction to his art was through studying art at college. Thanks to computer software, changing photos into a typical Andy Warhol style before tracing and painting them was just a little too easy for my class and was often encouraged by our lecturers. This gave me the impression that Warhol’s work, and the entire pop art movement, was based on simplistic, straightforward lines and colour but, when you really break things down and eliminate the technology we have today, things are not as basic as my younger mind would have had me believe. 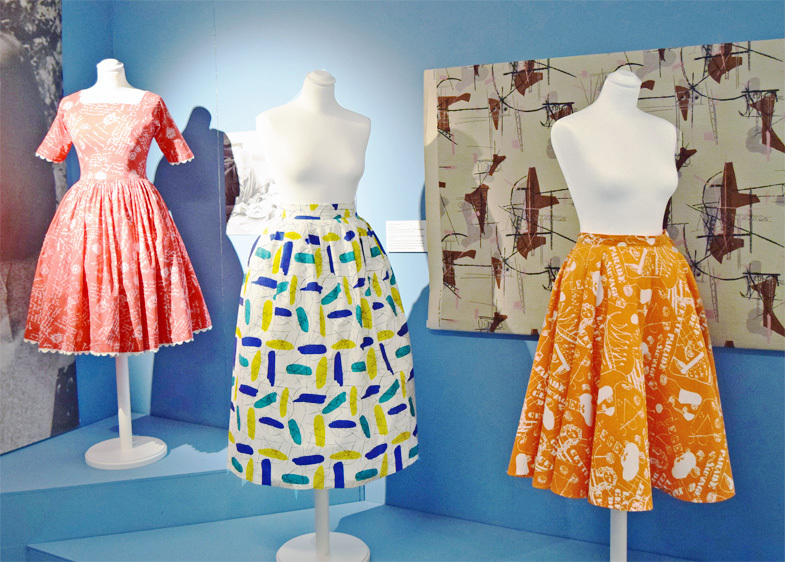 The Warhol designs featured in the Artist Textiles exhibition proves how wrong I was. The Warhol prints on display are predominately brightly coloured and, dare I say, childlike. 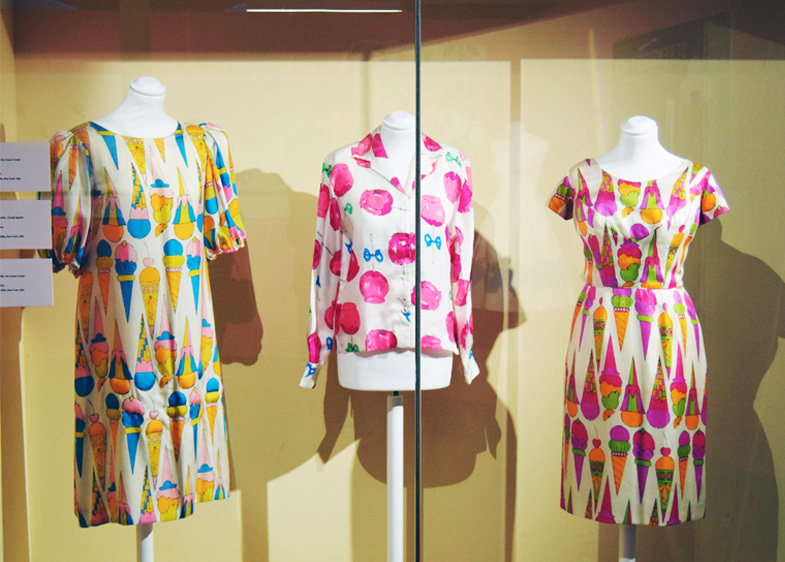 When I initially noticed the clothing behind the glass window, I assumed they were multi-coloured patterns made up of triangles, it wasn’t until I got closer that I realised that they were in fact, beautifully bold ice cream cones and lollipops that made me crave artificially flavoured food from my childhood. While the vast majority of the pieces in the exhibition feature an abundance of colour, Warhol tops them. Each design is instantly recognisable as the work of Warhol and has given me a whole new appreciation for not only his talent but the movement he played a huge role in. While I came to the Artist Textiles exhibition expecting to pay a significant amount of attention to the Salvador Dali designs and learn more about a man I admire, I ended up walking away with a new found love of a style I once resented. 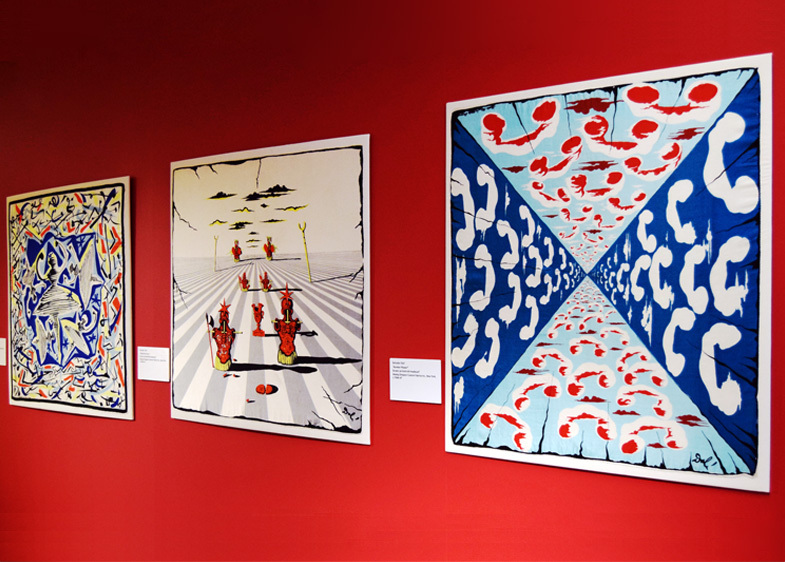 Salvador Dali’s attention-grabbing silk scarf designs received my praise and admiration but it was Warhol who provided me with a new perspective. There are many highlights throughout the exhibition but ultimately, it was the bright colours and obscure patterns that won me over. Disclaimer: This post is in collaboration with the New Lanark Visitor Centre.